These buildings are a part of the Wine Market which features 16th century buildings. The unique architecture of these buildings are sure to catch your eye as you enter the Woernitz Tor, which is the oldest tower in Dinkelsbuehl. Photo by Alexis Tucker. GRAFENWOEHR, Germany — An overlooked, history-lover’s treasure, Dinkelsbuehl is a medieval town charmed by stories of the past and a day-trip for those of us in the Bavarian footprint. Surrender of Swedish troops after interference of children in the Thirty Years War is among the most famous tales of the city. There is even a children’s book called Once upon a Dinkelsbuehl written in commemoration of the town and event. According to legend, a boy approached the Swedish general before ordering a siege on the city. He resembled the general’s son — whom he recently lost to illness — so much that the general decided to spare the town. Dinkelsbuehl celebrates the Swedish surrender every summer in a historical festival known as Kinderzeche. The town reenacts the attack of Swedish troops, and children dressed in traditional clothing receive candy after saving the city. Dinkelsbuehl also remained remarkably intact — with the exception of a broken window in St. George’s Minister — during the plunders of both World Wars. In addition to its rich history, the city also has an aesthetic, small-town charm. 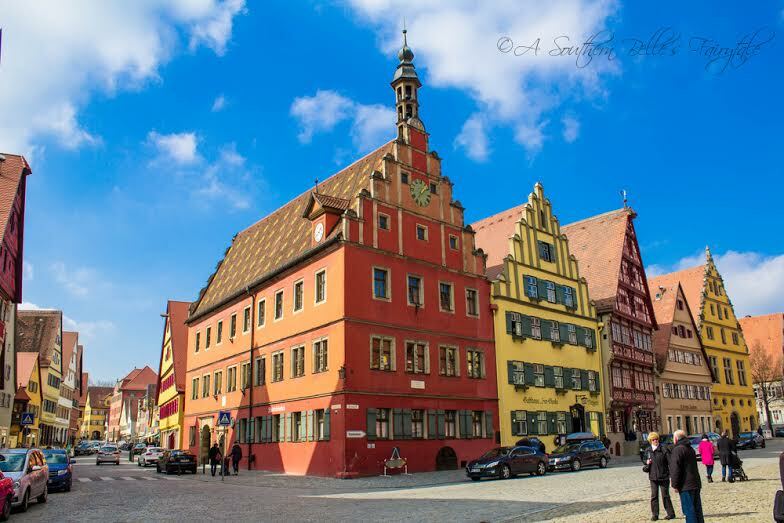 Many of the beautiful buildings on Wine Market Street were built in the seventeenth century, and the town is part of southern Germany’s Romantic Road, a path based on Roman routes that take tourists through the most scenic and historic sites. Dinkelsbuehl is listed among top must-visit European towns on several Pinterest pages and, unlike its sister-city Rothenburg ob der Tauber, is often overlooked by tourists. The town is about a two-hour drive from Grafenwoehr. Visit the information center for a free map of the city in English. Park for four euros all day.